This menu contains entries allowing to use third-party applications to view or edit part or all of the document being edited. Requires an element to be implicitly or explicitly selected. 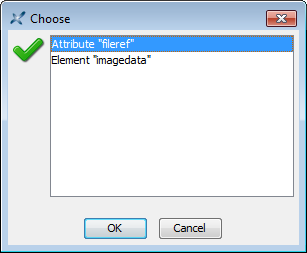 Displays a dialog box allowing the select this element or one of its attributes from a list. Opens specified element or attribute in a third-party ``helper'' application. If the helper application cannot be determined automatically (because it has not yet been registered using the Preferences dialog box, Helper Applications section), the user is prompted to specify it. Example of use: use your web browser to open the page referenced in the url attribute of the (DocBook 4) ulink element. 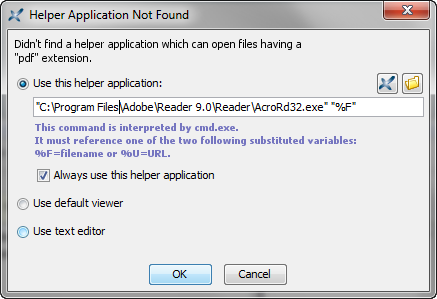 Same as above except that the helper application is assumed to be an editor. If this editor is used to modify the element or attribute, then the changes are also automatically applied to the document being edited. This command works as follows: let's suppose the element of interest contains an image encoded using base 64 (data type xs:base64Binary). It starts the helper application, an image editor, passing it the file containing the extracted image. Examples of use: use GIMP to edit the image file referenced in the src attribute of the (XHTML) img element. Use Inkscape to edit the svg:svg element contained in an (DocBook 5) imagedata element. Opens the document being edited in a third-party ``helper'' application. If the helper application cannot be determined automatically (because it has not yet been registered using the Preferences dialog box, Helper Applications section), the user is prompted to specify it. This entry is disabled if the document is newly created and has not yet been saved. Also note that this command is guaranteed to fail if the document is stored on the Windows file system and is currently write-locked by XMLmind XML Editor. Example of use: use your web browser to preview the XHTML document being edited. Same as above except that the helper application is assumed to be an editor. XMLmind XML Editor will automatically reload the document after the third-party editor is used to modify it. This entry is disabled if the document is newly created and has not yet been saved. Also note that this command is guaranteed to fail if the document is currently write-locked by XMLmind XML Editor. Example of use: use your favorite text editor to perform some low-level modifications on the XML document being edited.